The government of Panama will not make public the data of individuals who have shell companies and trusts registered in Panama or by Panamanian accountants, lawyers and bankers, according to Mr. Gian Castillero, an advisor to the government of Panama on international financial services. Information on individuals who have shell companies in Panama will only be made available to competent authorities upon request, and will be conducted under very strict regulations and privacy to protect the holders, said Mr. Castillero, responding to questions from journalists during a panel on what the government of Panama was doing to provide access to information on secret accounts held in Panama. “Panama would create a major security problem if it decided to open up all the data and make it available,” Castillero insisted. Many find his position less than convincing. 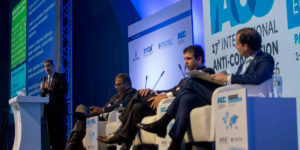 The 17th IACC is being held eight months after the biggest data leak in history, the Panama Papers. Data leaked from Panamanian law firm Mossack Fonseca showed how dictators and dubious characters from all over the world and their cronies had created companies with the help of the firm to stash away some of their money, evade tax and launder money. In Kenya, there was revelation that Alfred Ndakwe, a Ponzi schemer who was shown to have swindled people out of more than US$20 million, had two shell companies in Panama, which he used to stash the loot. There were similarly shocking revelations across the globe. A commission formed to develop and propose reforms to Panama’s financial services industry has published a report recommending more robust oversight of the financial services sector to stop illegal money being funneled through Panama. But it needs political goodwill from the legislature and the executive, so that independent and sound administration can be offered. It will also require enhanced capacity for the Panamanian officials implementing the recommendations. The biggest threat to the reforms, however, will be the attitude adopted across the globe. The independent experts from the commission present at the conference, Roberto Artavia and Domingo Latoracca, pointed out that Panama is not even among the top 50 tax havens in the world. Panama therefore feels that the pressure should be spread equally across the globe, on all countries, to strengthen regulations on international financial services. Previous panel members, Nobel winner Joseph Stiglitz and Swiss anti-corruption expert Mark Pieth, quit the panel citing a lack of independence, and later released their own reports. This report recommended that every country should establish a searchable public registry that identifies the owners and beneficiaries of all entities established within its borders and punish lawyers and other professionals who knowingly set up entities whose primary purpose is to evade taxes or engage in money laundering. In the report, the experts have suggested measures that will only comply with “international standards” but will not represent a revolutionary reform. Worse still for the opponents of tax havens, economies of countries like Panama benefit immensely from these services, hence the seeming reluctance to do anything about them. Mr. Latoracca argues that it is fundamental for Panama to still have the financial flows – legally, of course – to contribute to the economy’s diversity. “We cannot overregulate the sector, because again, that will make us uncompetitive and we will lose our market to other countries and players who offer international financial services,” Mr. Castillero adds. Andrew Ochieng is an award winning journalist with experience reporting on corruption, politics and environmental issues. He works for NTV in Kenya and has been in the media since 2009. Ochieng was a finalist at the FPA Awards in London in 2014 and has been a winner of the Media Council of Kenya excellence in journalism awards.